Some washing machines have cloth driers. It contains a drum in which wet clothes are kept. As the drum rotates, the water particles get separated from the cloth. The general description of this action is that “the centrifugal force throws the water particles away from the drum”. Comment on this statement from the viewpoint of an observer rotating with the drum and the observer who is washing the clothes. The person rotating with the drum will observe that centrifugal force and coriolis force act on the water particles and the person washing the cloth will observe that water particles are thrown outward (away from the drum) and no pseudo force is acting on the particles. 3313rev/minute. The coin does not slip on the record. Where does it get the required centripetal force from? The coin gets the required centripetal force from the frictional force between the coin and the record. A bird while flying takes a left turn, where does it get the centripetal force from? The bird tilts its body and tail in such a way that the air around offers a dragging force in left direction, perpendicular to its initial direction of motion. This dragging force provides the necessary centripetal force to take the left turn. Is it necessary to express all angles in radian while using the equation ω = ω0 + at? No, it is not necessary to express all the angles in radian while using the equation ω = ω0 + at. If ω (angular velocity) and α (angular acceleration) are in rad/s and rad/s2, respectively, we will get the angle in radian. After a good meal at a party you wash your hands and find that you have forgotten to bring your handkerchief. You shake your hand vigorously to remove the water as much as you can. Why is water removed in this process? While shaking, our hand moves on a curved path with some angular velocity and water on our hand feels centrifugal force in the outward direction. Therefore, water get detached from our hand and leaves it. A smooth block loosely fits in a circular tube placed on a horizontal surface. The block moves in a uniform circular motion along the tube. Which wall (inner or outer) will exert a nonzero normal contact force on the block? The outer wall will exert a non-zero normal contact force on the block. As the block moves in a uniform circular motion, centrifugal force in radially outward direction acts on it and it comes in contact with the outer wall of the tube. mv2r, the direction is vertically upward. If the vertically downward force is not greater, water will not fall. mω2ris the centrifugal force acting on the coin. 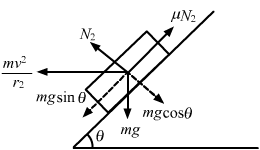 N=mg-mRω’2From the above equation, we can conclude that F1 > F2. 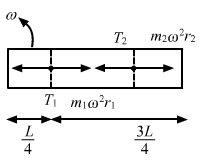 T=mgcosθThat is, at the extreme positions, the tension is the string is mgcosθ. A car of mass M is moving on a horizontal circular path of radius r. At an instant its speed is v and is increasing at a rate a. (a) The acceleration of the car is towards the centre of the path. (c) The friction coefficient between the ground and the car is not less than a/g. 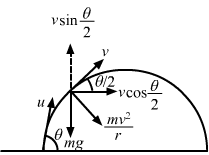 mv2r, it will not move forward, as its speed (v) is increasing at a rate a. A circular road of radius r is banked for a speed v = 40 km/hr. A car of mass of m attempts to go on the circular road. The friction coefficient between the tyre and the road is negligible. (a) The are cannot make a turn without skidding. (b) If the car turns at a speed less than 40 km/hr, it will slip down. The friction is zero and the road is banked for a speed v = 40 km/hr. If the car turns at a speed less than 40 km/hr, it will slip down. 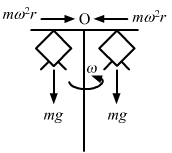 F→on a particle of mass m and finds that the particle moves in a circle of radius r with a uniform speed v as seen from an inertial frame of reference. (a) This is not possible. (b) There are other forces on the particle. (d) The resultant of the other forces varies in magnitude as well as in direction. We cannot move a particle in a circle by just applying a constant force. So, there are other forces on the particle. Find the acceleration of a particle placed on the surface of the earth at the equator due to earth’s rotation. The diameter of earth = 12800 km and it takes 24 hours for the earth to complete one revolution about its axis. 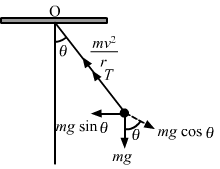 mv2R=fsN=mgHere, fs is the force of friction and N is the normal reaction. 3313revolutions per minute. The distance of the mosquito from the centre of the turn table is 10 cm. Show that the friction coefficient between the record and the mosquito is greater than π2/81. (a) By what friction is the dinbalance reag less than hits true weight? (b) If the speed of earth’s rotation is increased by such an amount that the balance reading is half the true weight, what will be the length of the day in this case? v2=rgtanθ-μ1-μ tanθ =20×10×0.11.2 =4.08 m/s=14.7 km/hrThus, the possible speeds are between 14.7 km/hr and 54 km/hr so that the car neither slips down nor skids up. dvdt=a. The friction coefficient between the road and the tyre is μ. Find the speed at which the car will skid. (c) (i) Before C, mgcosθ-N=mv2r⇒N=mg cosθ-mv2r =707-25=682 N(ii) N-mgcosθ=mv2r⇒N=mv2r+mgcosθ =25+707=732 N(d) To find the minimum coefficient of friction, we have to consider a point where N is minimum or a point just before c .
In a children’s park a heavy rod is pivoted at the centre and is made to rotate about the pivot so that the rod always remains horizontal. Two kids hold the rod near the ends and thus rotate with the rod. Let the mass of each kid be 15 kg, the distance between the points of the rod where the two kids hold it be 3.0 m and suppose that the rod rotates at the rate of 20 revolutions per minute. Find the force of friction exerted by the rod on one of the kids. 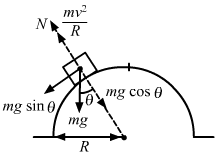 mg=mv2rHere, r is the radius of curvature of the curve at the point. 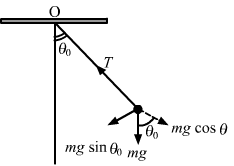 dvdt=vdvdsto obtain the speed of the block after one revolution. 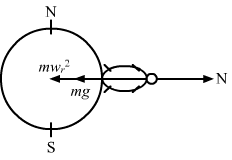 μN=μmv2R(c) Let at be the tangential acceleration of the block. ∴mω2R cosθ=ma⇒a=ω2RcosθLet the time taken by the particle to reach the point B be t.
N=mv2r=0.1×10050=15=0.2(b) The plate is turned; so, the angle between the normal to the plate and the radius of the rod slowly increases.